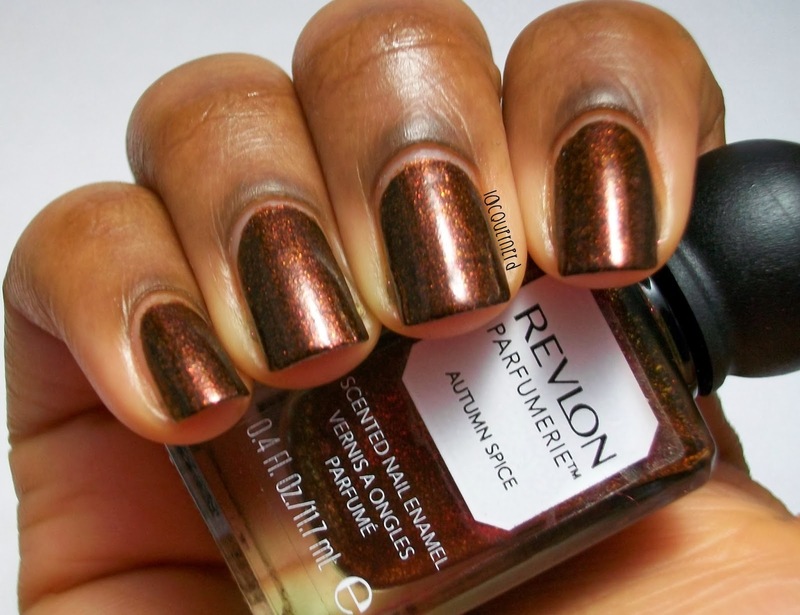 I have a swatch of Revlon's Autumn Spice for you today. This is actually my first Revlon and scented polish, so I was excited to see how this polish would turn out. I really like this polish and it smells so good too! Let's take a look! 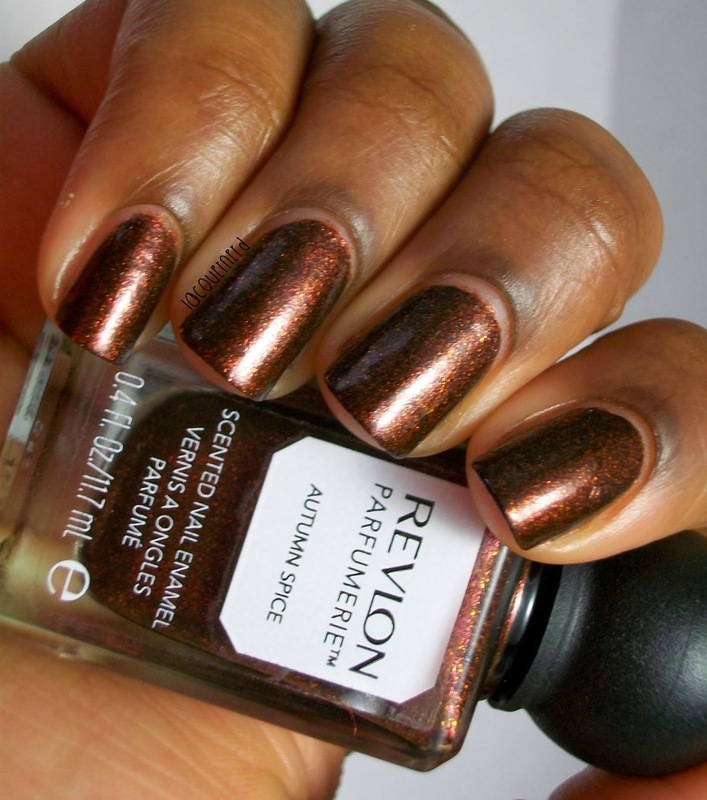 Autumn Spice is a copper brown polish with micro gold, orange, and pink glitter. This is two coats without a top coat.This is almost a one coater, but it's best to do two coats. The application and formula were good to work with. I actually wore this on Christmas and I had a hard time applying it because of the ball on the top of the brush, but I didn't have any trouble this time. I guess it just takes getting used to. The fragrance smells so good. I would say it smells like cinnamon and spice for the most part. It really reminds me of autumn. The great thing about it is that it's not overpowering at all, which is what I like the best. Don't smell it by itself though! I made the mistake of doing that the first time I opened it and it was bad lol. I decided to add on to it by creating dots with my dotting tools. 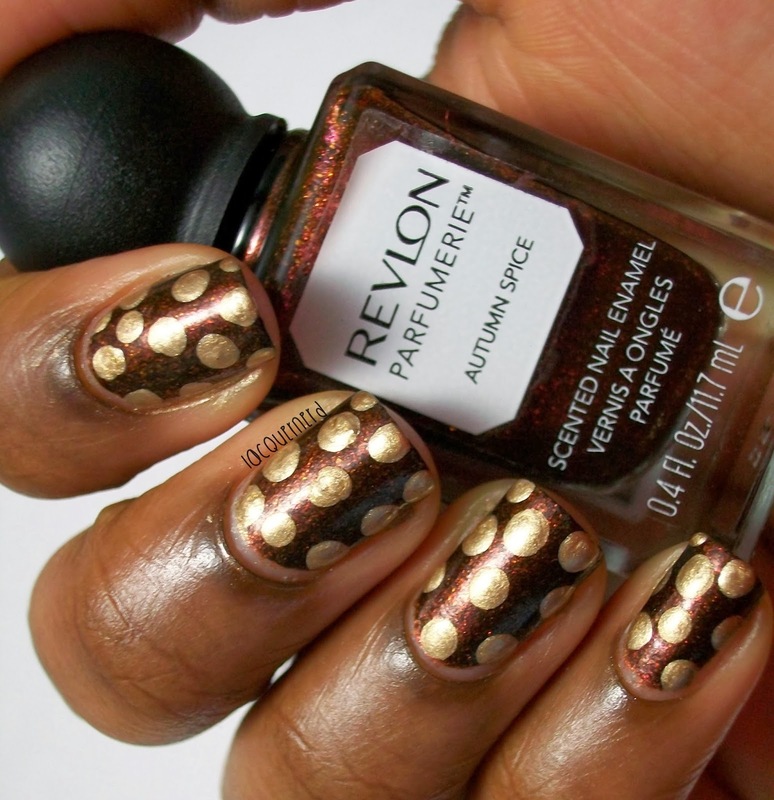 I used Sinful Colors Gold Metal for the dots. This is the perfect color combination. I'm so glad that I added the gold dots to it. 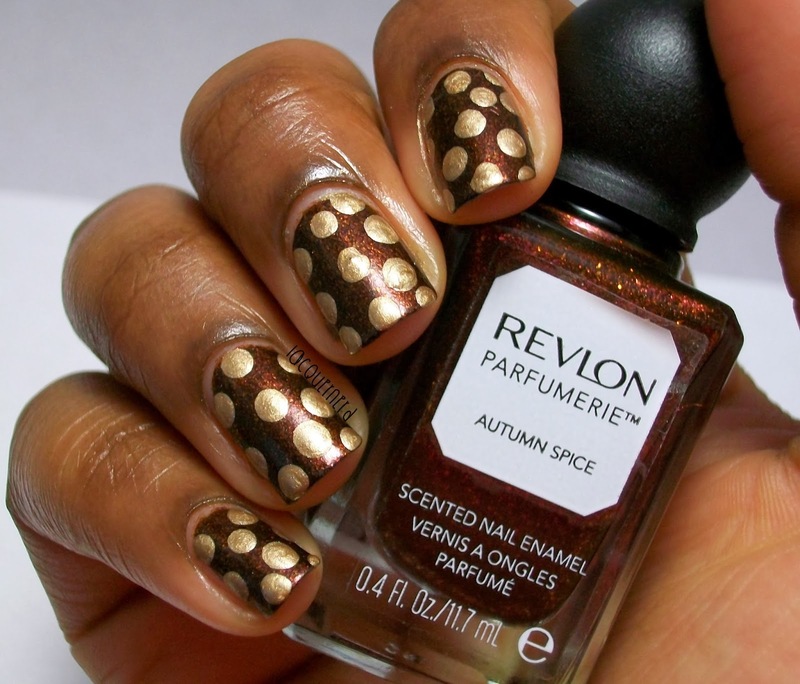 The dots really bring out the color of Autumn Spice. 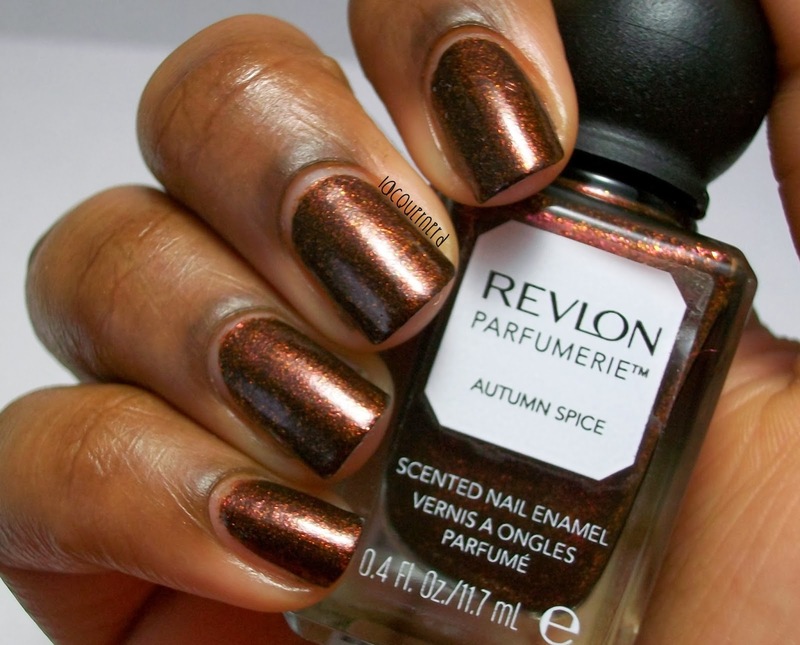 Overall, I love Autumn Spice. It has a great formula and scent. I would recommend picking this up and some of the other colors if you're interested. I really want to try more in the collection if they're as good as Autumn Spice. What do you think of this polish and design? 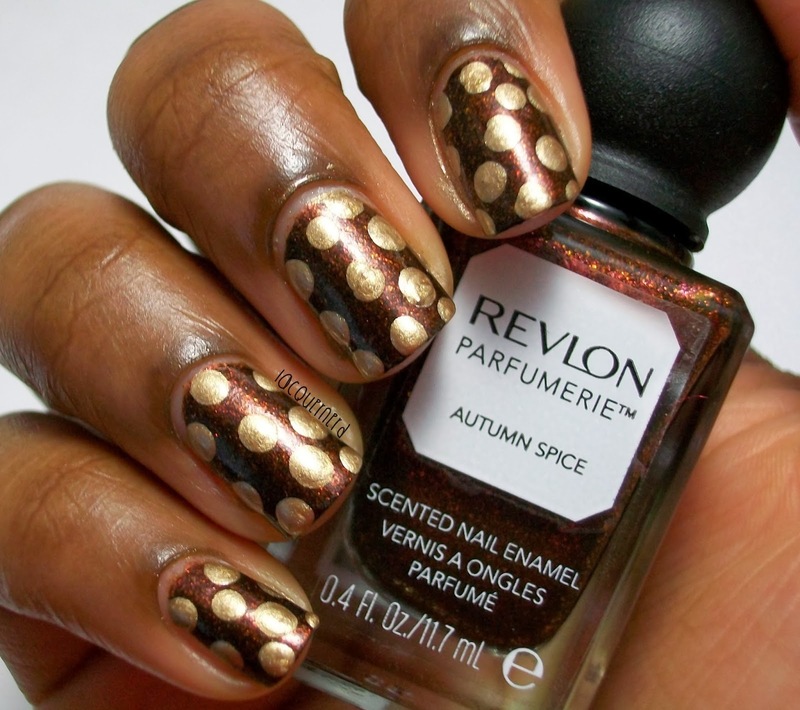 Have you tried any of the Revlon Parfumerie polishes yet? Oh gosh, I also have this polish! Painted it on a swatch stick thingy and it was smelling lovely for almost a month! Oh wow lol. Mine still smells right now and I keep smelling my fingers because it's such a lovely scent lol. Thank you! It really does, I was going to do another color, but I'm glad that I stuck with the gold dots. Aww, I hope they get over there soon so you can have them ^^.